First of all when it comes to equipment selection, it is important to first realize that the dive industry as a whole doesn't make "bad" dive equipment anymore. 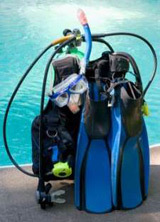 They do, however, make different types and styles of equipment to fit the specific needs of recreational and technical divers. With this said, when shopping for new equipment, the professionals at Ventura Dive and Sport will ask more questions on what kind of diving you like to do than what manufacturers you are interested in. The reason is simple: we want to match you to equipment you'll use on a regular basis and for a very long time! With equipment from only the best manufacturers in inventory, you can't really go wrong. Once you have the basics (mask, snorkel, fins, boots and gloves) your next step will probably be regulators, gauges and computers. Additionally, you may wish to take a look at wetsuits and BCDs (buoyancy control devices.) Once you have made the all-important decision to invest in dive equipment, you'll want to consult with one of our professional dive-staff members to ensure you get the right style, size and features to grow with your advancements in diving. Remember, you have already invested in learning to become a diver and the best way to protect that investment is by embracing equipment ownership. People who own their own equipment dive more often, travel more often, and have the peace of mind that goes along with knowing exactly where, when and how their equipment was last serviced.